The basic objective of GST is to remove trade barriers by creating a common domestic market for goods and services at a national level. GST will be an answer to this goal which is a broad based tax levied at multiple stages of production and distribution with the taxes on inputs credited against taxes payable on output. At the same time, revenue is protected by being collected throughout the chain of economic transactions but without any distortions in production processes or decisions. Tax collected at any intermediate stage is only a pass through transaction leading to an incentive for tax compliance. GST thus, seeks to achieve economic efficiency and tax neutrality. On a optimistic note, it has been stated in Union Budget 2015-16 that introduction of common Goods and Services Tax (GST) could be a game changer. GST will put in place a state of the art indirect tax system by 1st April 2016. The economic situation is therefore upbeat, on a rise and forward looking so far as growth and reforms are concerned. The Government has already introduced the Bill to amend Constitution of India for Goods and Services Tax (GST) in December, 2014 in Parliament. GST is expected to play a transformative role in the way our economy functions GST will add buoyancy to economy by developing a common Indian market and reducing the cascading effect on the cost of goods and services. The Budget speech reaffirms the commitment to have GST in place from next year. “I have already introduced the Bill to amend the Constitution of India for Goods and Services Tax (GST) in the last Session of this august House. GST is expected to play a transformative role in the way our economy functions. It will add buoyancy to our economy by developing a common Indian market and reducing the cascading effect on the cost of goods and services. We are moving in various fronts to implement GST from the next year. As a part of the movement towards GST, education cess and secondary & higher education cess have been subsumed in excise duty and Service Tax in the present Budget. Further, the general rate of excise duty will be rounded off from 12.36% (including cesses) to 12.5%. In case of Service Tax, it will go up from 12.36% (including cesses) to 14%. However, no clear cut road map on GST as to how GST will be introduced from 1st April 2016 and preparedness there for. Going by the present mood, the Government of the day feels that it may be able to introduce GST in India w.e.f. 01.04.2016, replacing a host of indirect taxes presently levied by the Centre , State and Local Bodies . It hopes for the parliamentary nod (two-third majority) in the forthcoming monsoon session in 2015. 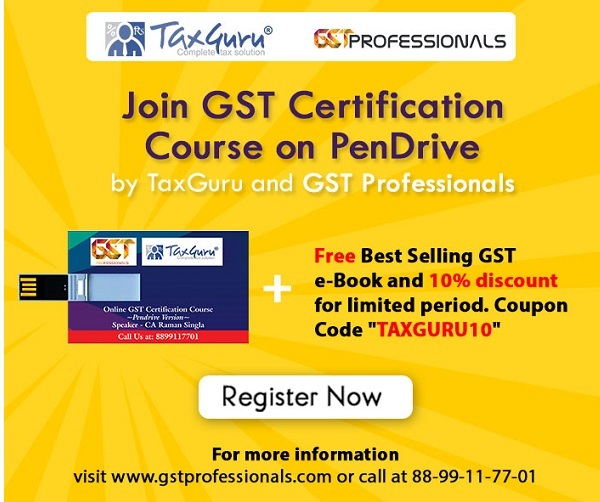 This is necessary as the Indian Constitution requires amendment to allow states to tax services and the Centre to tax goods at the retail level and to provide legal framework for GST by providing for constitution of a GST Council and dispute settlement mechanism. GST is expected to play a key role in bringing about more transparency into the tax system. Instead of fiscal concessions, concessions to select industries on grounds such as environmental protection etc. could be provided in a transparent manner through cash refunds or otherwise. While unified rate may be there, states may be allowed to charge rates most suitable to them such as on alcohol, petroleum products, etc. A very strong infrastructure network would be required to administer GST which would include facility for online payment of tax and e-filing of returns. The GST as a new levy could be a very effective tool and break-through in indirect tax reforms, provided it is made simple and assessee-friendly – not like the present tax system. Not only GST is expected to change the complexion of indirect taxation in India, it will also bring down the prices of goods and services across the board. The consensus among the states (29) and between the Centre and states hold the key. Once consensus is reached, GST may see the light of the day in a year’s time, even during any time of the year, it being a transaction based tax. While there is no doubt that GST will come, the sooner the better, it should also address the problems in present day taxation i.e., it should seek to achieve rationalization, boost transparency, offer flexibility to Union and states and broaden the much needed tax base. If GST comes into operation, it would achieve the status of integrated and most comprehensive set off tax structure in India leading to enhanced economic activities and tax buoyancy. GST would offer a complete set off and there will be no tax cascading effect as there will be no tax on tax, an ideal proposition for all. Even the Government won’t mind as tax revenues would go up substantially (VAT is a live case). In the Empowered Committee meeting held on 22.04.2015, it was resolved that with the near consensus position, it augers well for the passage of Constitution Amendment Bill in the next session of Parliament. The Constitution (122nd Amendment) Bill, 2014 had since been passed by the Lok Sabha on 06th May, 2015 but Rajya Sabha referred the Bill to a Select Committee to review (12.05.2016). The Select Committee had already met once on 22 May, 2015 and is expected to submit its report by the end of first week of forthcoming monsoon session of Parliament. You have mentioned that “Simply put, goods and services tax is a tax levied on goods and services imposed at each point of sale or rendering of service”. You mentioned that tax is imposed on sale of goods or rendering of services. But, THE CONSTITUTION (ONE HUNDRED AND TWENTY-SECOND AMENDMENT) BILL, 2014, definition of GST is “goods and services tax means any tax on supply of goods, or services or both except taxes on the supply of the alcoholic liquor for human consumption”. So the new concept of supply is introduced rather concept of sale or provision of service. But the definition of supply has not been given. We shall have to wait for the draft GST Laws.